Every year my daughter loves to watch the Kid's Choice Awards and this year we've invited a friend over for a little viewing party. 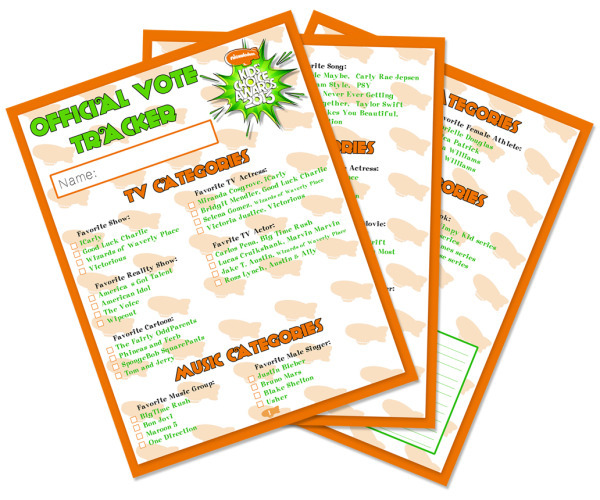 We've been brainstorming food and decoration ideas over at Pinterest, picked out green and orange outfits, and created a Vote Tracking Sheet to fill out while they watch. My daughter is a list maker so she was all over this one! I just love how involved they feel because their votes are deciding something. I know its only for entertainment but its a nice concept to pass on. Feel free to download and print! You can fill out your choices before the show then circle the winners as they are reveled. Enjoy the show!